Highly rated models of Solar Panels are now running in excess of 20-percent efficiency at turning sunlight into electricity. But they are bulky and still aren't very pretty. In addition, traditional solar panels take up a lot of room. Fortunately, solar technology is changing continuously. Earlier this year Tesla began selling solar shingles that can generate power for the home and still look like ordinary shingles. Other solar panel developers have made solar windows, skylights, patio covers, carports, and roads to generate electricity. And now researchers in the Netherlands say they have developed a process for making conventional bluish-black solar panels bright green. Probably the same technology might also make it possible to create panels in other colors, and even in white which would be a really big step in the solar industry. Researchers from AMOLF, the University of Amsterdam (UvA) and the Energy research Centre of the Netherlands (ECN) have developed a method for imprinting existing solar panels with crystalline silicon nanocylinders. The nanocylinders are about 100 nanometres wide and exhibit electromagnetic resonance that scatters a particular wavelength of light. They produce the green color by scattering green frequencies of light back while letting other frequencies of light pass through. 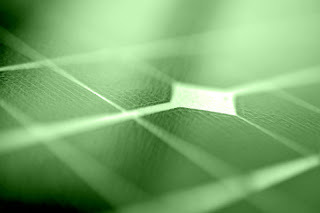 They are laid down on the solar cells via a process the researchers likened to rubber stamping. The panels have a green appearance from most angles and they are only about 10 percent less efficient than conventional panels. The method used for the Colored Solar Panels is called soft-imprint lithography. “In principle, this technique is easily scalable for fabrication technology,” AMOLF scientific group leader and senior author Albert Polman said. Such colored solar panels would afford a level of versatility - for example, red panels could be used on rooftops, white ones on walls, and the green ones could blend in with nature. Thus would encourage the reliance on solar energy and integration of solar technology into every part of our daily lives. “You have to combine different nanoparticles, and if they get very close to each other they can interact and that will affect the color,” said Polman. These aren't the first colored solar panels. But the ones already on the market use dyes and reflective coatings that give them their color, greatly reduce efficiency and they are about 45 percent less efficient than ordinary solar panels at generating electricity. The new design was published online on August 15, 2017, in Applied Physics Letters.